Enterprise Sales, Marketing & Inside Sales Team Build Out, First International Customers Acquisition, Enterprise Pricing etc. I understand, we have heard these topics in multiple events & conferences, so why this round table be different? The difference is gyan vs hearing from real person with real experience which sometimes exactly what you want to hear, even reading 10 books will not help compared to one line coming from a CEO who has done it over and over again and seen the success. In this Round table, Aneesh was leading and moderating the discussion. He leveraged the experience of other founders which made the most out of few hrs of interaction. The participants are founders of mid-stage startups, who have good-size customers and have decent ARR (Annual Recurring Revenue), growing and scaling. This blog narrates the learning in the form of Q&A. How to establish a meaningful and sustaining Partnership for your B2B enterprise business and grow your business? Partners could be the companies who are into services (in your industry vertical like healthcare or retail etc) and likes to have monthly revenues. If your product sit on top of other product and integrates then go for a partnership program to the base product. For instance, if your product complements or built on top of Salesforce, then you can enroll in Salesforce has AppExchange program wherein you can list your product and generate good visibility and leads. Partners, could be the product that your software compliments or built upon it. Partners could be the implementation companies of the product that your product built on or compliment. Say your software built on Salesforce, then the service companies who are implementing Salesforce solution could be your partners. You could also go for two-way partnership, like I push your product and you push mine, sometimes one partner performs a lot better than the other, in that case, be open and refine the terms as you go in the journey. If you are enrolling in partnership programs from large companies like IBM, Salesforce etc and see if you can use their promotion events and brand your product, many gives a free offer for promotion. You might end up in getting leads worth a lot that might seems impossible to generate by the solo marketing you do on your own. These large companies also have paid outreach which has high outreach and see if it is worth investing. How to bring transparency in partnership? You might also want to try “Lead Protection Program” which creates 100% transparency in the leads generated, let your partners enter the leads in your CRM & both of you can track the status and you can also make sure that right analytics are coming out. Partnership takes time to achieve, so keep experimenting, be conservative and go slow, do a some sort of pilot before you sign larger partnership contract. And ready to fail as it takes time to get into right partnership. How to acquire customers in new international market? You can go with the existing customers and if they have business overseas then you can approach them for the initial open door to international market. LinkedIn is a great source to find first few pilot customers in that region. And also cold calling for opening doors also worked for few startups. If your product is like B2C then publishing in appstore, Appstore marketing, google adwords would be a good start, but if you are in B2B and enterprise sales, then the steps mentioned in the beginning are the way to go. Once you have handful of customers internationally, select a country where you could open a small sales team may be start with one or two guys and these guys need not be very senior like VP level, 2 yrs to 5 yrs exp and they have to work with India Sales team parallaly. You might need to travel and stay there for a while for initial years to establish a sales pattern oversees. 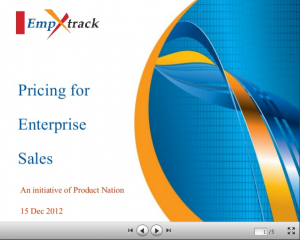 How is to do pricing for your product? See your competitor price and product features and how much it solves the customer problem, how your product makes them dependable, this combination will help you to arrive at pricing. If your product a lot better than your competitor, do not lower your price to compete, you need to stay at a price tag for the right product. If your product does not have India based competitor, see the US pricing and create some kind of benchmark value to arrive your pricing. You can have different packaging but not too many, max 3 to 4. You kind of have to experiment with pricing, for e.g one of the enterprise product was priced it 5k for the first few customer during pilot (initial years) and when they need to sell the product in the second year to a bigger organization, they tried quoting 1L and end up in selling at 60k. So you need to try and see how market is reacting for your new pricing, first few year keep experimenting, you will be able to arrive at pricing between 1 to 3 yrs if not before. When you sell enterprise product, make the price attractive in the pilot stage and after showing the desired results, you can go for high price and the customers would not mind paying it as they have seen the results which impacted their top line. The pricing could be geography based and can be different. And again, find the right pricing by seeing your competitor and demand in that market. If you want to give freemium version, give it free but let the customer give you some kind of asset that you can use for your business like marketing or brand building. For e.g refer 2 friends to get the free version or share in your facebook page to get the access. Some kind of exchange of benefits for freemium version. What is the most painful growth in the entire journey of the startup? While growing fast, you need to be careful when reaching to new markets, not all regions works great for your product. US need not be the best market for all products. If you have invested in one region and seems like it is not working, then shutdown and alternate your sales strategy in overseas. Please refer “acquiring customers in new international market” for more details. How to upsell and cross-sell to your existing customers? An customer account is usually handled by an account manager, the upsell/cross sell need be done by different person say group account manager. Every group account manager handles multiple accounts, like 5 to 10 accounts, is responsible for upselling. The account manager finds opportunities for upsell. Do not mix up the account manager dealing with customer on day-to-day basis to do upsell as the negotiation will become very tricky otherwise. How to give discounts to the customers in SaaS product? The discounts needs to be distributed, do not give them at one go. For instance, do a yearly subscription with 2 months off. Those two months are going to be 11th and 12th month. So incase they leave in 6 months, these discounts does not qualify. Another way you could spread across 3 years like 3rd month, 6th month off, 22th month off for discounts. How much is the typical yearly renewal increase in ARR for the Enterprise Product? How to get testimonials and referrals? Usually testimonials are done after building a strong relationship with a customer. Usually after 1 or 2 years. Make sure that the account managers and CXO’s of the company has a good relation built with customers to ask for testimonials. Once you establish those soft links, whenever the customer delightness go very high and initiate the process. e.g Release of product feature which solves one of their pain point which the customer demanded for a while. Another idea is to mention this in the subscription or contract time itself. Suppose if the customer is asking for discounts then you can tell him that you can enroll in the “Loyalty Program” in which you might have to give testimonial & also give 2 referrals and participate in the case study within the first 2 years and you are eligible for this much discounts. This way the customer is well aware of the expectation and also enjoys discounts. Do not give discounts for free, make him have some benefits offered to us. Does awards and recognizing important for startup? Have some sort of recognition award or have an article or mention in international news & media like Techcrunch, Harvard Business Review, Gartner, Marketing Magazine, Forbes, Wall Street Journal etc.This will help both India & international brand building. Name some books good for Inside Sales and for Complete Sales? Is there any online tests used as a first-cut of sales roles? How to provide incentives for your IS(Inside sales) team? Incentive are always a motivating factor for the Inside Sales team. We have laid out some numbers as a sample for you to see below. 2% to 3% of Annual Recurring Revenue(ARR) for new customer acquisition. 2% to 2.5% of annual revenue for UpSell/Cross Sell or have a fixed amount like 10k for all revenue of 3L to 5L per year, 5K for 2L to 3L etc. You can also say, if you get a referral from a customer then the account manager gets 5% of revenue. Make sure these numbers are published and you make sure the check is given to him as soon as you receive them from the customer. We would be writing another blog on a related & demanding topic “How to set up a Inside Sales Team from scratch & generates Leads?” in the upcoming week.Stay Tuned and Happy Reading!